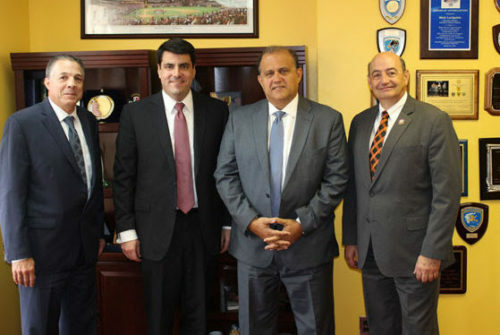 (L-R) Rhode Island Senator Leonidas Raptakis, George Representative Chuck Efstration, AHI President Nick Larigakis, MNA Gerry Sklavounos. WASHINGTON, DC — Rhode Island State Senator Leonidas P. Raptakis, Georgia Representative Chuck Efstration, and M.N.A. Gerry Sklavounos of the Quebec Assemblee Nationale, visited Hellenic House to meet with American Hellenic Institute (AHI) President Nick Larigakis, October 24, 2017. State Senator Raptakis serves as the vice chair on the Committee on Special Legislation and Veterans’ Affairs, Committee on Judiciary, representing the 33rd district of Rhode Island. M.N.A. Gerry Sklavounos is a deputé who represents the Laurier-Dorion riding. State Representative Efstration is an administration floor leader and represents the 104th district of Georgia. Mr. Damilakis Eftychios and Nick Larigakis. In addition to the meeting with Greek American and Greek Canadian legislators, President Larigakis met with Mr. Damilakis Eftychios, advisor to Member of Hellenic Parliament Vassilis Leventis, October 17, 2017. MP Leventis is the president of the Union of Centrists Party. 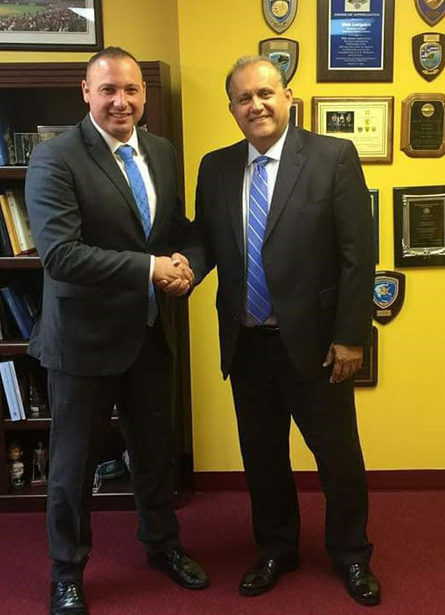 “It was a pleasure to speak with Mr. Eftychios on areas of mutual interest specifically relating to U.S.-Greece bilateral relations,” Larigakis said. The American Hellenic Institute is a non-profit Greek American think-tank and public policy center that works to strengthen relations between the United States and Greece and Cyprus, and within the Greek American community.